...the only people for me are the mad ones, the ones who are mad to live, mad to talk, mad to be saved, desirous of everything at the same time, the ones who never yawn or say a commonplace thing, but burn, burn, burn, like fabulous yellow roman candles exploding like spiders across the stars and in the middle you see the blue centerlight pop and everybody goes "Awww!" What is that feeling when you're driving away from people and they recede on the plain till you see their specks dispersing?—it's the too-huge world vaulting us, and it's good-by. But we lean forward to the next crazy venture beneath the skies. On the Road is the easiest novel to find "great lines" in. Open to any page. Jack Kerouac's writing is at such a consistent intensity that important, poetic, rhythmic, quotable sentences typical of the book's overall tone are found wherever you turn. You can also read the book this way, opening it at random and immersing yourself in whatever crazy adventures are at that point engulfing Sal Paradise (a stand-in for the author) and his bohemian buddies—especially that charismatic conman and man-child Dean Moriarty (Kerouac's real-life friend Neal Cassady), but also including Carlo Marx (based on Allen Ginsberg) and Old Bull Lee (William S. Burroughs). Not that their escapades are particularly exciting in the sense of suspenseful action. Rather, they usually involve getting stoned, talking themselves into a frenzy, raving over music, falling in lust, or simply getting high on life. In the big American cities. In rural backwaters. In Mexican whorehouses. En route between these places. What makes it thrilling is the writing. It's like nothing you've read before. At least nothing written before 1957, before others got around to imitating Kerouac's apparently free-flowing style. First, On the Road is conventionally punctuated, even if many lines do run on very long in the most excitable parts. So, although Kerouac may have knocked out the original draft in a frenzy, it was certainly edited into shape—at least into readable paragraphs and sentences—at some point. 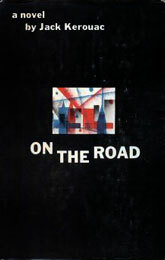 Second, On the Road is thought to have been written in 1951 and is known to have gone through several revisions as Kerouac looked for a publisher. When he finally found one in 1955, he had to cut it by a third. Apparently seven typescript versions of On the Road have been indentified. I'd be very surprised if the final version looked very much like the first. Any good writer will re-write and reshape as he cuts. If the final version looks seamlessly spontaneous, I'm sure it took hours of sweat to achieve that effect. Third, On the Road is just too well written to have emerged intact from Kerouac's drug and booze-fevered forehead. I've seen the kind of prose that wonderful writers produce while they're loosening up, when they're hammering out text without concern for structure or consistency. It's not pretty—not yet, not in that form. And it's certainly not sustained over pages. On the Road maintains its level over hundreds of pages. It's not all brilliant of course. Much of it is mundane: we drove here, we drove there, we slept, we woke up in a ditch.... But it all makes sense. It's all of a piece. And enough of the novel is brilliant to make it inconceivable that it could have been produced without a lot of thought. True, On the Road s famous for being unstructured. Kerouac purposely avoided literary conventions, attempting to create a new, more liberated kind of fiction. Yet, running through the novel are a few stories that do develop and reach climaxes of sorts. Another storyline involves the conflict between narrator Sal's search for love, acceptance and domestic bliss on one hand and his attraction to the mania represented by Dean and the excitement of the adventurous life on the other hand. We never really reach a decision on this issue in On the Road, but we do arrive at an acceptance of the eternal contradiction. And the trip to that point is so artistically exhilarating, we don't really want a resolution.